The No. 18 Case Western Reserve University men’s tennis team headed to Kalamazoo, MI to take on Rose-Hulman Institute of Technology and No. 30 Kalamazoo College. The Spartans defeated the Fighting Engineers 8-1 and 5-0, while dropping the game against Kalamazoo 5-4. The Spartan’s record is now 13-9. As usual, first-year players Jonathan Powell and Neil Mabee took the first win, 8-2. 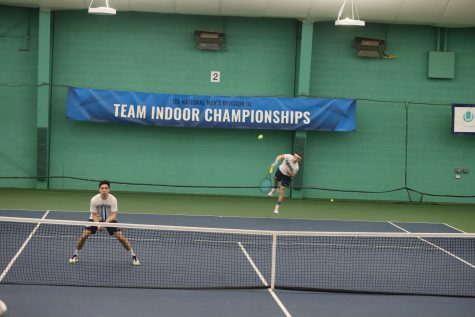 Second-year player Sam Concannon and first-year player Matthew Chen continued the winning streak by picking up an 8-4 win, which fourth-year player James Fojtasek and second-year player Anthony Kanam were able to replicate. 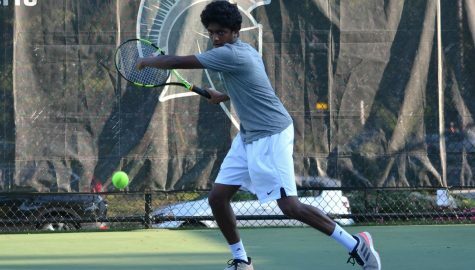 The Spartans carried their doubles momentum into singles play. Kanam started strong with a 6-2, 6-1 win, and third-year player Rob Stroup locked up the fifth victory with a 6-1, 6-2 win. Other victories include a 6-1, 6-0 win from second-year player Siddharth Rajupet and a clean 6-0, 6-0 sweep from Concannon. Fojtasek was the Spartans’ lone loss in this series, dropping a tough match 6-4, 5-7 and 10-6. Having played their opponents once, the Spartans repeated similar success from the first day. All three doubles pairs took home victories. Powell and Mabee won 9-7, while Chen and first-year player Josh Hsia followed with an 8-1 victory. Second-year player Zach Hennessey and first-year player Earl Hsieh blanked their opponents to an 8-0 victory. Confident from his doubles win, Hennessey defeated his opponent 6-0, 6-1, while Mabee played a clean 6-0, 6-0 game to win the series for the Spartans. The remaining four singles matches were not finished. The game against University of Wisconsin-Eau Claire was cancelled due to weather. The critical moment came against Kalamazoo, as the Spartans wanted to prove themselves against another nationally ranked team. As in the previous matches, the Spartans had a strong start in doubles play, with Mabee and Powell dominating with an 8-0 win while Fojtasek and Kanam continued with an 8-5 win. However, Concannon and Chen fell at third doubles, 8-6. “Going up 3-0 was a big advantage … the [last doubles] win definitely gave them momentum,” Powell said. Kanam continued his dominant performance from the doubles to the singles, with a 6-1, 6-4 win at third singles. Powell did the same at sixth singles, with a dominating 6-0, 6-0 win. Stroup struggled in a 4-6, 6-2, 6-1 loss, and Kalamazoo secured the win with a 6-3, 6-2 loss by Concannon at fifth singles. “[Stroup] was grinding for two and a half hours, he was still playing when [Concannon] got off the court. [Concannon] wasn’t playing offensively enough, [and was] bullied on the court. We didn’t expect to lose to a No. 30 ranked team,” Powell said. 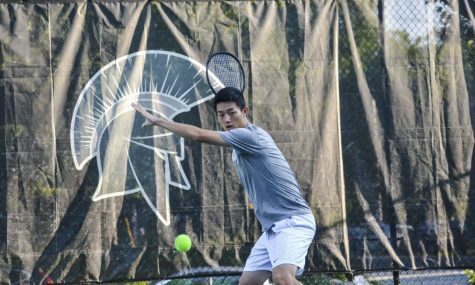 The Spartans will stay at home to host New York University (NYU) and Ohio Wesleyan University on Saturday, April 21 at the Medical Mutual Tennis Pavilion.